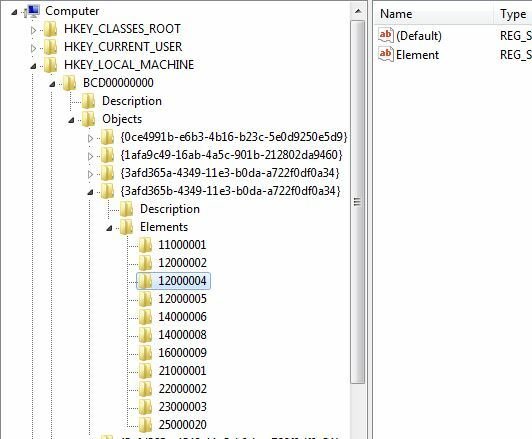 The HKEY_LOCAL_MACHINE\BCD00000000 key exported as a registry file (.reg) can be seen here. This corresponds to the CODE column in the Objects section of the Objects and Elements page. In this example 0x10200003 is a /application osloader object. 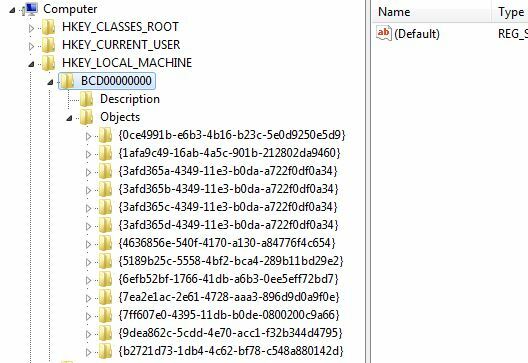 If a system store is in use if will already have been mounted as the HKEY_LOCAL_MACHINE\BCD00000000 key. It's possible to mount other BCD stores in regedit using the File > Load hive... menu option. Alternatively use reg.exe from the commandline. Attempting to manually overwrite a mounted BCD store resulted in the following error - "Cannot edit Element: Error writing the value's new contents." Attempting to import/merge a .reg file to overwrite a mounted BCD store resulted in the following error - "Cannot import: *.reg: Not all data was successfully written to the registry. Some keys are open by the system or other processes." "If you examine the permissions of the BCD00000000 branch, you�ll see that it has Full Control set for the SYSTEM account, but the administrators group has Special permissions which is just Read-Only plus WriteDac which grants the ability to set permissions. (You may need to click the [Advanced] button because the basic dialog indicates that SYSTEM has Special access as well, but the Advanced Security Settings dialog shows it correctly set to Full Control.) When you run Regedit (which requires elevated privileges), it runs under the context of your user-account and gets the administrator-group permissions, thus you cannot write to it. When you use the bcdedit command, it runs under the SYSTEM account context which has write permissions. If you enable the User Name column in the Task Manager, you can see that Regedit is run by your user account and bcdedit is run by SYSTEM." Despite issues with regedit it is possible to edit a mounted BCD store using reg.exe - this is covered in the Device - Locate section of these notes.